Our popular Jack the Joker Fundraiser will continue this Sunday night in Kennedy’s Live where the Jackpot will be €2,160 as on Sunday night Maurice O’Donnell was drawn out of the drum and picked card 40 which wasn’t the Joker though he did win €50. Alice and Oisin and Michael Daly won €25 each. As well as our group of ticket sellers tickets can be purchased from Convenience Store Ballinroad, The Village Inn, Village Flowers, Kennedys Live, Spar and Mousies Takeaway. This Sunday our Club Bingo continues in the CBS Hall at 8:30 pm where the jackpot is €1200. One of our most loyal and dedicated club members Liam O’Connor is calling on all Abbeyside / Ballinacourty members, players, supporters, friends and cycling enthusiasts to support a Fundraising Cycle which he is organising on Saturday August 4th. Liam is organising the cycle from Limerick to Abbeyside to raise much need funds towards the running and further development of the club. As you all know the club has had huge success on the playing fields last year and all our club teams and ladies represented the club with great pride throughout the year. The club would not be able to run as smoothly as it currently does without the huge volume of volunteers who give so much of their time to coaching teams, by working on committees and doing countless tasks in fundraising and all other events run by the club. The facilities in our club have been brought to a new level in recent years thanks to the generosity of all in our Parish who give very generously when club people come calling at their homes, work places, shops and businesses to raise funds to help pay for projects such as the refurbishment of the dressing rooms, installing state of the art floodlights and generator to run lights, the erection of a state of the art ball alley to improve hurling skills and the purchase of almost 8 acres and the developing of the third pitch which will cater for the needs of the club teams for many years to come. We would like to thank all those people who have dug deep into their pockets to allow the club to be able to provide all these amenities. Liam is calling on any who would like to join him on the cycle to let him know in the next few weeks. The cycle will cater for all levels of cyclists and will involve a trip of around 85 to 90 miles. Please contact Liam or Michael to let them know of your interest and meetings will be organised to let people know of what it takes to be a part of a huge fun cycle. Liam can be contacted at 0851191908 or liam.oconnor@augh.com or Michael can be reached at michealcosgrave@hotmail.com or 0877682068. This Sunday we play St.Olivers in the Western Semi Final at 2pm in Fraher Field. 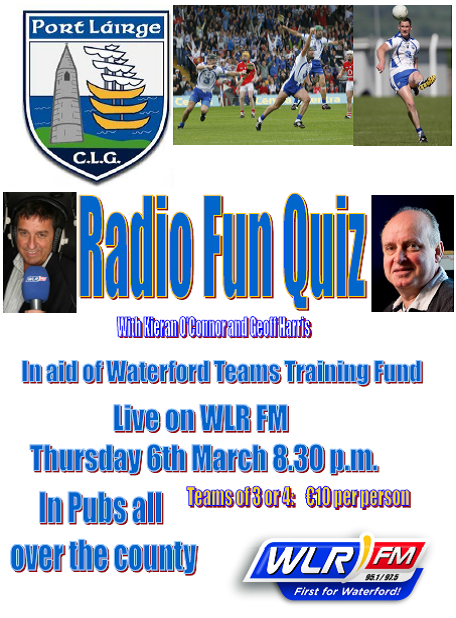 On Thursday night, March 6th Minnies Bar will be the venue for our Club members who wish to take part in the County Board Radio Quiz with proceedings getting under way at 8pm. Our next game is at home to the Nire on Sunday 2nd March. Our under 14’s started their season last Wednesday night with the Feile Football Western semi final against St Oliver’s in Aglish. The team played well and came away with the win. We started the Championship on Sunday morning at home to An Ghaeltacht and again the lads put up a good display to record a win. We would like to wish Cian Fagan a quick recovery from his recent injury. Panel: Jake O’Riordan, Eoin Ahearne, Danial Raher , Sean Kent, Fergal Roche, Johnny Treen, Meldan O’Dwyer, Eoin Flynn, Shane Kiely, Dathi Brunnock, Jamie Walsh, Ben Flynn, Senan Travers, Cian O’Riordan, Michael Kiely, Sean Roche, Barry Morrissey, Rory Ahearne, Patrick Fitzgerald, David Hayes, Michael Troy. Our next game in the under 14 is away to St Olivers. First under 13 game against An Ghaeltacht is on Sunday 2nd March. On the 15th February we travelled to Bohadoon & Ballinameela to take part in a U-9 hurling blitz. We had 13 U-9s and great fun was had by all, with the skill levels of all the children evident for all to see. The teams participating in Bohadoon were An Gaeltacht, Dungarvan, St Pats, Fourmilewater and Abbeyside. In Ballinameela we had Ardmore, Clashmore, St Olivers and Abbeyside. The boys who represented Abbeyside are Sean Walsh, Darragh Walsh, Kieran and Darragh Cosgrave, Jake Fitzgerald Drummy, Sean Queally, Daniel Morrissey, Jamie Mulcahy, Ethan Keohan, Cormac Dunne, Billy O Connell, Conor Gough, Brian Callaghan. On the 22nd 2 groups competed in a U-9 football blitz again in Bohadoon and Ballinameela. The boys acquitted themselves well against strong opposition. A very high standard was displayed by all teams on the day. The teams in Bohadoon were Nire, Dungarvan, St Pats and Ballinacourty. In Ballinameela St Olivers, Ardmore and Ballinacourty were in attendance. The panel was Sean Walsh, Darragh Walsh, Kieran and Darragh Cosgrave, Jake Fitzgerald Drummy, Sean Queally, Daniel Morrissey, Jake O Donnell, Jamie Mulcahy, Ethan Keohan, Cormac Dunne, Billy O Connell, Jack O’Donovan, Brian Callaghan. Our under 8 panel was delighted to get an invitation to Walsh Park on Sunday last to play at half time in the national hurling league game versus Galway. All the kids had a great day out and we thank the parents of all the children most sincerely for bringing the kids to the game. Our minor football team started their county championship on Saturday afternoon last away to Gaultir. After a hard fought game we came away with victory on a scoreline of 2-9 to 0-4. Well done to all. Our indoor hurling for the juvenile hurlers continues again on this Friday night coming the 21stth February at the Friary College .The under 5, 6 and 7 groups will between the times of six to quarter to seven and the under 8 group will between the times of quarter to seven and half past seven. All are welcome. Helmets are compulsory and will be available over the next few weeks. To help cover costs a €2 fee will apply. Membership forms will also be given out to parents of players who have not received them yet and also collected off those who have. Our popular Jack the Joker Fundraiser will continue this Sunday night in Kennedy’s Live where the Jackpot will be €2,000 as on Sunday night Claire Cosgrave was drawn out of the drum and picked card 28 which turned out to be the Joker Card, meaning she scooped the Jackpot of €9,100. James, Jack and Joey and Fran and Lar won €25 each. As well as our group of ticket sellers tickets can be purchased from Convenience Store Ballinroad, The Village Inn, Village Flowers, Kennedys Live, Spar and Mousies Takeaway. This Sunday our Club Bingo continues in the CBS Hall at 8:30 pm where the jackpot is €1150. On Saturday last our Under 21 footballers beat Brickey Rangers in Fraher Field in the first round of the Western Championship. They now play St. Olivers in the Western Semi Final on Sunday March 2nd at 2pm in Fraher Field. TEAM: K. DWANE, S. O’GORMAN, E. BERGIN, S. O’CONNOR, J. ELSTED, B. LOOBY, C. McCARTHY, C. PRUNTY, D. COLLINS, B. HENLEY, C. KINDREGAN, D. SWEENEY, S. CLIFFE, M. MAHER, D. LOOBY. SUBS: C. O’DWYER, P. COLLINS, R. ROCTOR, K. DEE, E. YOUNG. Our Club Social took place last Saturday in the Park Hotel, and it turned out to be a fantastic night where we will be presented medal s to our victorious Senior and Under 21 Football teams and our Junior Hurling Team. Also on the night we made presentations to Brian Looby, Conor Prunty, Kevin Dee, Laurance Power, Eoin Kiely, Michael Maher, Sean Daly and Kevin Dwane who won All Ireland Colleges medals with St. Augustine’s College and Colaiste Dún Garbhán last year, whilst a special presentation was also made to our generous club sponsor Jack O’Hare in recognition of the great support his company Adesco have given to our club for the past number of years. Following speeches by our Chairman Bernard Shields and County Chairman Tom Cunningham the medals were presented to our players by Tom Cunningham after which all those in attendance enjoyed themselves immensely into the early hours of Sunday morning. We would like to thank all those who worked so hard to make the night such a success and a big thanks to our MC Kieran O’Connor who rushed home from Thurles to be with us on the night. On behalf of all in the club we would like to send our deepest sympathies to the family and many friends of the late Pete Clancy, Murphy Place, who passed away last weekend. Pete was a very talented player who gave many fine performances in our club colours for many years and this tradition was carried on by his sons who also gave sterling service to our club in their playing days and continue to work for the club today. Once again we send our sympathies to all Pete’s family and friends especially his wife Bernie. We would also like to send our sympathy to Pajoe Lanigan on the death of his father John (Jackie) Lanigan, Holycross, Co.Tipperary. Jackie was a regular visitor to Abbeyside for many years traveling down to support our teams especially if Pajoe was involved with training the teams or if his grandsons were playing for us, and was always great company to be in after the games. Ar dheis lámh De go raibh a anam usuail. The club's social takes place this evening at 7:30pm in the Park Hotel. 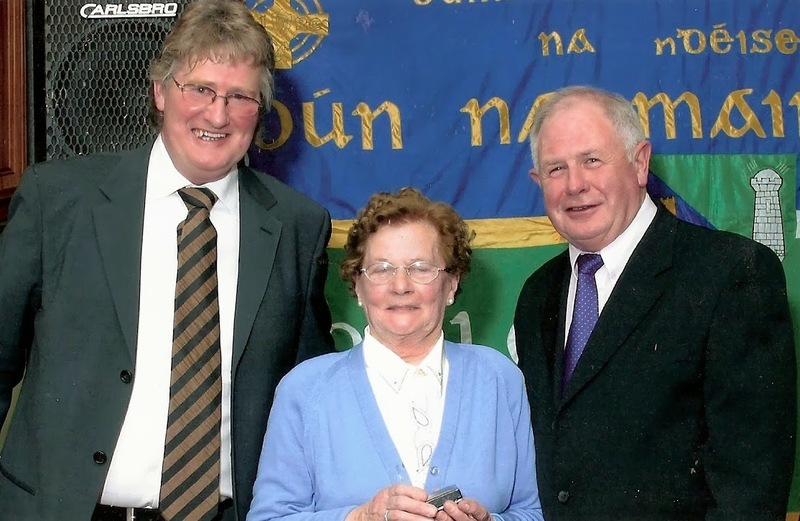 Our photo this week comes from the club social of 2004 and shows Greg Fives and Tony Mansfield presenting Club President, Margaret Cashin with a memento to acknowledge her many years of support for, and commitment to, CLG Dún na Mainistreach / Baile na Cúirte. The Cashin family continues to play a prominent role in the club. We continued our winter Hurling & Football League last Wednesday in our own astro turf which is turning out to be a great success. Any under 11/ 12 player who has not been present over the last couple of weeks or even in the last 12 months is welcome out as we can add players to these panels. It starts at 7 pm and finishes at 8 pm with plenty of fun and enjoyment. Down - Eoin Flynn (Captain), Adam Carroll Lawlor, Donnacha O Dwyer, Daniel Treen, and Darragh Slevin. Mayo - Tony Dwyer (Captain), Willie Beresford, JohnJoe Queally, Colin Foley, Alec Norris. Kerry - Niall Buckley (Captain) Jack Riordan, Sean Og Flynn, Cathal ‘the Gooch’ Cosgrove. New York - Ben O Donovan (Captain), Conor Kent, Oisin O Riordan, DJ Kiely. Our indoor hurling for the juvenile hurler’s starts again on this Friday night coming the 14th February at the Friary College .The under 5, 6 and 7 groups will between the times of six to quarter to seven and the under 8 group will between the times of quarter to seven and half past seven. All are welcome. Helmets are compulsory and will be available over the next few weeks. To help cover costs a €2 fee will apply. Membership forms will also be given out to parents of players who have not received them yet and also collected off those who have. Due to unforeseen circumstances the Friary was not available to us for the last two Friday nights and this is why we are only starting this week. To all parents and kids who weren’t aware that the Friary was not available we apologise for any inconvenience caused. Texts will be sent of times of training etc to any parents signed up to our teamer service. 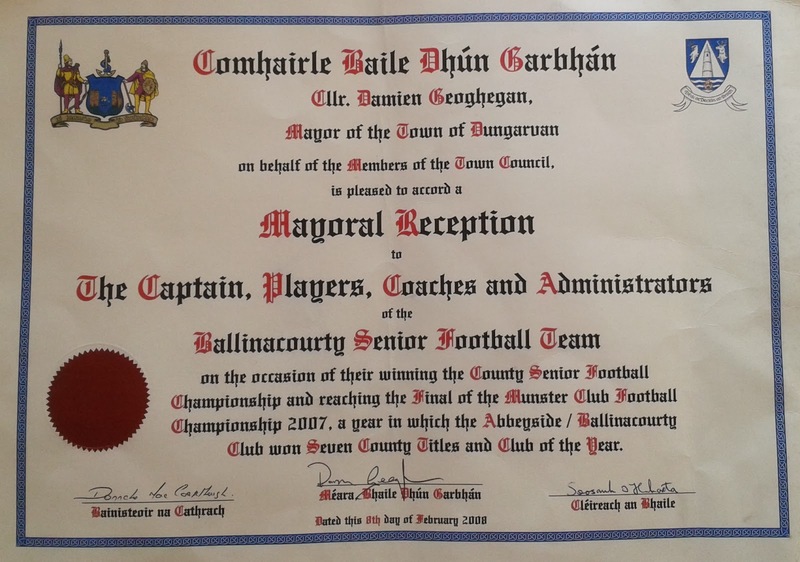 On this day in 2008, Dungarvan Town Council accorded the club a Mayoral Reception in recognition of our victory in the County Senior Football Championship, participation in the Munster Club Senior Football Championship Final and our being named 'Club of the Year' for 2007. This week's photo shows the commemorative scroll received by the club on the night. Our popular Jack the Joker Fundraiser will continue this Sunday night in Kennedy’s Live where the Jackpot will be €8,848 as on Sunday night Ger Walsh was drawn out of the drum and picked card 7 but did not find the Joker, yet he did win €50. Michelle Dwane and Joss Organ won €25 each. As well as our group of ticket sellers tickets can be purchased from Convenience Store Ballinroad, The Village Inn, Village Flowers, Kennedys Live, Spar and Mousies Takeaway. This Sunday our Club Bingo will return to the CBS Hall at 8:30 pm where the jackpot is €1050. Our Club Social has been fixed for Saturday February 15th in the Park Hotel, and it promises to be a great night where we will be presenting medals to our victorious Senior and Under 21 Football teams and our Junior Hurling Team. Tickets costing 25 euro can be ordered from Michael Ferncombe, Kevin Tobin, Niamh Enright, Jonathan O’Donovan, Tiernan Murray or Neil Moore. Please note tickets must be purchased in advance as no money will be taken on the night. This weekend tickets will be on sale in Minnies Bar on Friday night, Alice O’Connor’s on Saturday night and Kennedy’s Live on Sunday night from 7 to 9 pm on all nights. On behalf of all in the club we would like to wish Ballysaggart the very best of luck ahead of their All Ireland Junior Hurling Final in Croke Park this Saturday. All team managers are reminded to please ensure that they have booked the pitch for training or matches with Michael O’Donovan. Our game against Dungarvan on Sunday last fell victim to the poor weather conditions and this Sunday we host Stradbally in Abbeyside at 11:30 am. Included Back Row (L to R): Patrick Power, Peter Chivers, Damien French, Dwaine Moore, Pat Veale, Fergal Cunningham, Jonathan Forsey, Liam Byrne. 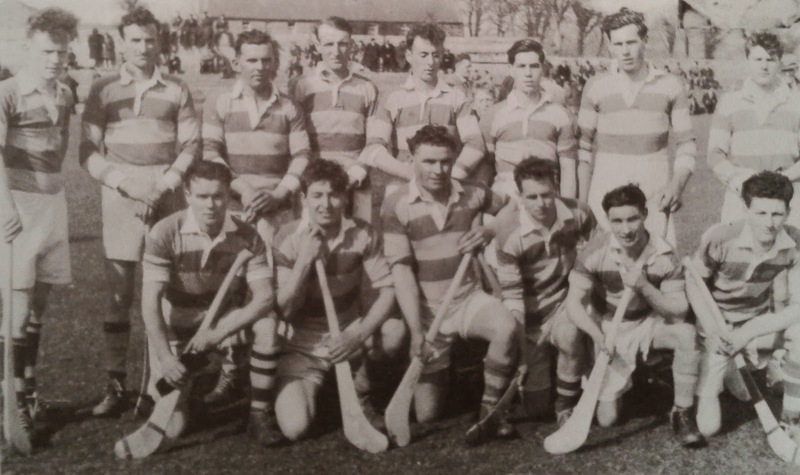 Included Front Row (L to R): Alan Mulcahy, John Clancy, Michael Sheehan, Benny Flynn, Dermot Ryan, Jimmy Stacey, John Paul Cosgrave, Jason O'Donovan, Michael O'Connor. 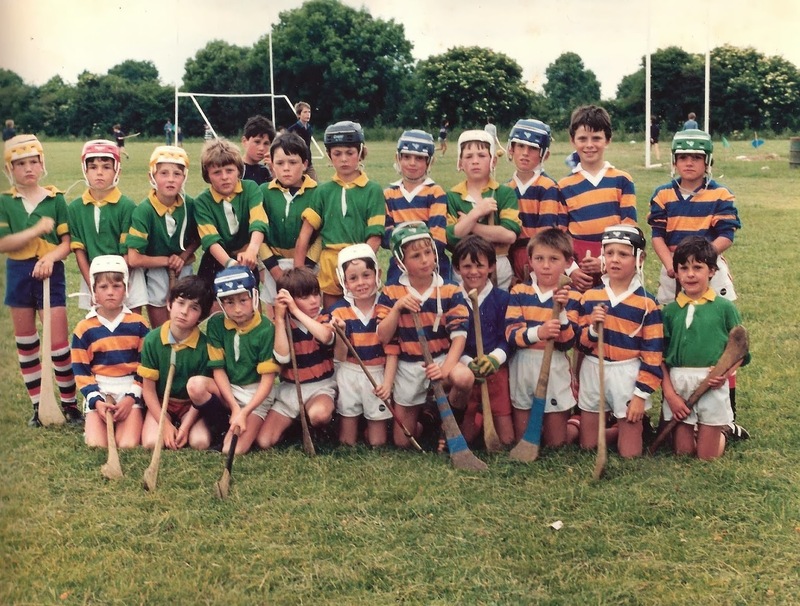 This week's photo comes from the mid 1980s and shows many underage hurlers at the club grounds. Lots of those pictured here went onto win juvenile and adult titles in subsequent years. Indeed now that their playing careers are over, some have taken to coaching the next generation of Abbeyside hurlers.